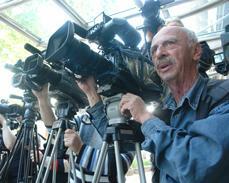 G-MEDIA is a four-year, USAID –funded program that aims to assist the Georgian media sector. Working with Georgian media outlets, media support organizations and journalism schools, the program aims to address internal and external obstacles to a professional, sustainable media. G-MEDIA also works toward building a media literate public that demands higher quality news and information. IREX has partnered with several international and local organization to implement G-MEDIA. These include the Georgian Young Lawyers Association, Transparency International-Georgia, and Social Impact. This program is made possible by the support of the American People through the United States Agency for International Development (USAID). The contents of this web site are the sole responsibility of IREX and do not necessarily reflect the views of USAID or the United States Government. Since the 2003 Rose Revolution, Georgia’s media sector has gone from a robust environment of diverse viewpoints to one largely controlled by a few interests often aligned with the political elites. There is troubling lack of transparency in media ownership, but it is clear most national television stations align their editorial policy with the government’s positions and a good portion of other media represent opposition interests. 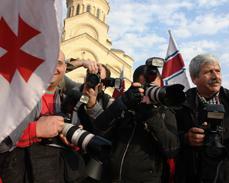 Georgians are left with few options for balanced, trustworthy news and little confidence their media sector is performing its watchdog role. While keenly attuned to these challenges, IREX will focus the G-MEDIA program on the routes to change. Georgia has many talented, dedicated media professionals, journalism educators and media freedom advocates – and more are waiting to gain the skills they need to join them. There is an increasingly vibrant and accessible universe of on-line information. There are more mobile telephones than land lines in Georgia. Blogs and social networks are taking off, while new and traditional media are converging around podcasts, discussion forums and citizen contributors. G-MEDIA will include a range of activities to best serve the Georgian media community. Targeted support for media outlets, curriculum development for educational programs, support for legal defense and networking media associations are just some of the activities planned under this program.